To celebrate the 30th birthday of one of the most successful Nepalese cricketer of all time, CricketConcern like to revisit some of the memorable moments of Paras Khadka that decorated his cricketing career. Just keep in mind that excellent Khadka isn’t completely done yet. The birthday boy will still play for his nation for at least five more years in my point of view. Representing Nepal for the first time, Paras Khadka, the most successful Nepalese cricket team captain started off his cricketing journey when he represented Nepal U15 cricket team for the ACC Asia Cup 2002 in UAE. That was the first instance when Nepal’s long run cricketing weapon introduced himself for the first time on an international level. Debut for Nepal Senior Cricket Team. He made his debut for the senior side in the same year when he played against Malaysia in the 2004 ICC Intercontinental Cup which was also his first-class debut. Later in the year, he played in the 2004 ACC Trophy in Kuala Lumpur in addition to ACC Fast Track Countries Tournament matches against Singapore, the UAE, and Hong Kong. In early 2005, he played in the Repechage Tournament of the 2005 ICC Trophy. Leading the junior Rhinos for the very first time. Nepal excelled some excellent performance in 2007 ACC Under-19 Cup in Kuala Lumpur in which Nepal won after beating Afghanistan in the final. His All-Round performance in the 2007 ACC Twenty20 Cup in Kuwait forced CAN to nominated this energetic young talent as captain of Nepal U19 team in the 2008 ICC Under-19 Cricket World Cup in Malaysia. He leads Nepal U19 team to the tenth-place of the tournament. Before the 2008 ICC Under-19 Cricket World Cup which he captained, he was quoted by the World Cup souvenir program as “arguably good enough to be in the line-up of any of the Test -playing countries”. First Tournament won as a captain. He successfully led the country to win the 2010 ICC World Cricket League Division Five which was just the beginning. He also successfully led the country to win the 2010 ICC World Cricket League Division Five as well as participated in ICC Twenty20 World Cup 2014. ESPNCricinfo compared him with great Kapil. ESPN Cricinfo said that he is Nepal’s Kapil Dev after he took two catches during the match against Afghanistan in the 2014 ICC World Twenty20, which helped Nepal seal the 9-run victory. In the 2015 ICC World Cricket League Division Two, he scored 185 runs in 6 innings at an average of 30.83 and picked up 6 wickets at an average of 22.83 and an economy rate of 2.63. which helped Nepal to qualified for the 2015–17 ICC World Cricket League Championship. Left his notch in Canada In May 2012, he went to play for the Ontario Cricket Academy and Club in Canada with the efforts of his national team coach Pubudu Dassanayake for a short four-month spell and his excellent performance there helped him to rejoin the club for 2013 season as Vice-captain. Selected in Marylebone Cricket Club squad. He was selected in Marylebone Cricket Club squad for the Emirates T20 tournament which was held in March 2015. He had a decent all-around performance there in the light of Yuvraj Singh and Alastair Cook. Paras Khadka’s ton against Namibia kept Nepali hope alive. Skipper Paras Khadka made flamboyant 103 off 94 in front of his home crowd. He hit five fours and seven sixes before falling in an LBW trap in 42nd over. That inning surely must be his most memorable innings till date. Most NSFJ Pulsar Player of the Year. He had won three NSFJ Pulsar Player of the Year till now is the most for any Nepalese cricketer. He had won NSFJ Pulsar Player of the Year 2066 BS, 2069 BS, and 2070 BS respectively. Man Of The Series Awards. 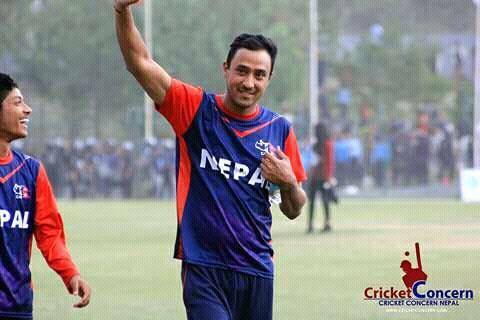 Paras Khadka have won four Man Of The Series Awards and TwentyFour Man Of The Match awards till today. First Man of the Series came in the 2012 ACC Trophy Elite tournament in UAE for his 291 runs in the competition. Second and third came in The 2013 ACC Twenty20 Cup and The 2015 ICC World Cricket League Division Two respectively. Fourth came when Nepal cricket team tour the Netherlands in 2015 and Paras share Man of The Series award with Ahsan Malik.